Quinta da Lontra (Farm of the Otter) is situated in Portugal’s highest mountain range, the Serra da Estrela, in Central Portugal. 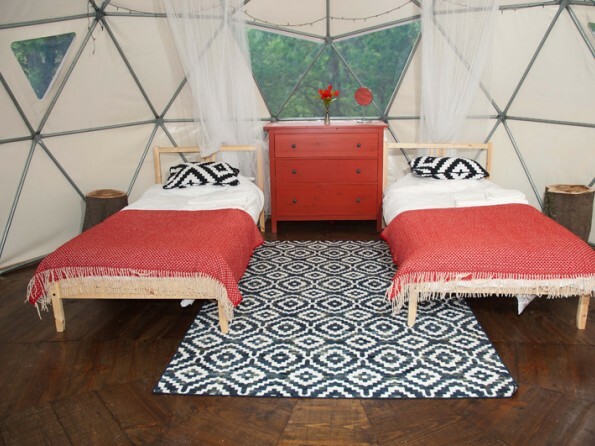 The three hectares of land offers a choice of accommodation, from glamping in a yurt or geodesic dome, to staying in one of two rural apartments. 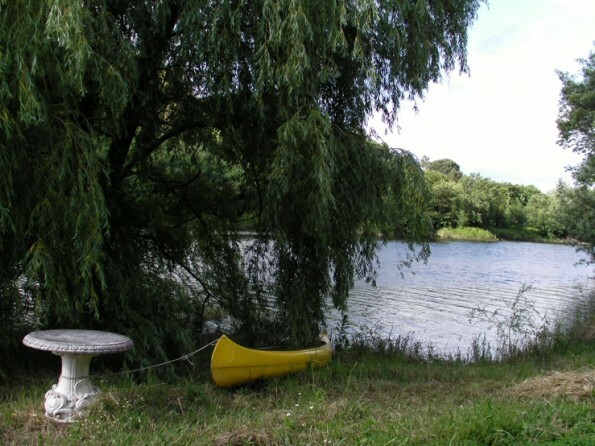 The farm is beautiful, peaceful and off the beaten track, with river beaches on site and wonderful walking all around. 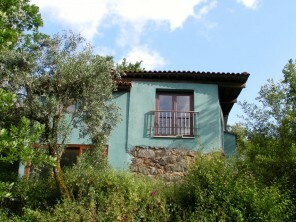 Quinta da Lontra is off-grid. All lighting and electric needs are provided by solar panels, and drinking water is filtered from the stream that runs through the land. Stay here for a low impact holiday! The farmland sits in beautiful unspoilt countryside in a river valley, accessible by dirt track from the main road and with the local wildlife for neighbours. European and cork oak woodland borders the farm, and the land is a combination of terraces and meadowlands with vines, fruit and olive trees, as well as sandy river beaches. 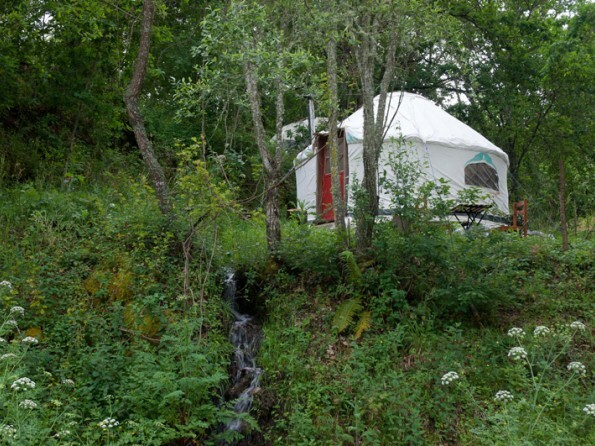 The yurts and domes are just a few metres from the Mondego river in a beautiful valley, surrounded by breathtaking scenery and with wonderful river walks on your doorstep. The Quinta is just 1.5km from the village of Povoa de Midoes where there are three bars / cafes and a small convenience store. There are several good restaurants in the neighbouring villages. You can walk for miles in any direction from the Quinta, along the river, admiring the scenery and the huge granite bolders along the riverside. For the more serious hikers the owners can organise walking excursions - the Quinta is one hour from the Serra da Estrela mountains which have truly breathtaking views. The owners can recommend a local guide to accompany you if you wish. If fishing is your thing, then bring a rod and try your luck with the carp and bream in the river. 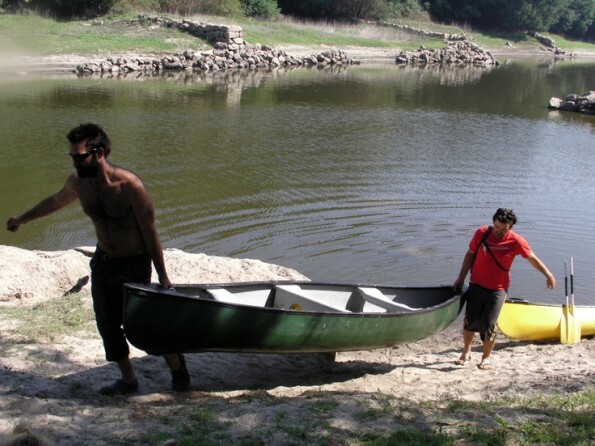 There are kayaks and canoes on site which you are welcome to use. If you are lucky, you might see some of the local wildlife such as otters, kingfishers, foxes and sometimes wild boar. 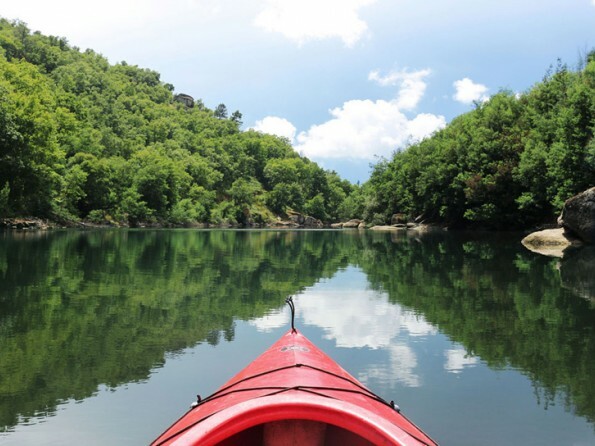 The owners can also recommend climbing and kayaking instructors for those who want to be more adventurous, or you can head the one hour drive to the ski slopes (usually open Jan - May). There are lots of traditional unspoilt cobble-stoned villages in the vicinity which are worth exploring, still untouched by tourism. Markets, historical sites, local museums all nearby. Porto airport is about a 2 hour drive. Lisbon airport is about a 2.5 hour drive. There are good rail links from Porto and Lisbon to Santa Comba Dao and Carregal do Sal, the nearest town. There is also the cheaper option of a coach to Tabua. 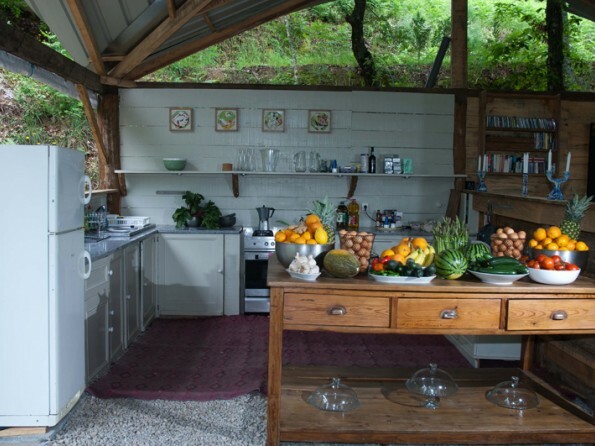 There are several glamping options at Quinta da Lontra. There are two yurts, each in their own terrace in shaded woodland, and both within 50 metres of the river. They are furnished with antique double beds, clothes rails, rugs and a log burner. Both yurts have solar reading lights for night time and a small solar system in the Eatery provided power for recharging small items like phones and laptops. There are also bell tents for hire on a weekly basis, which each come with low double or single beds and are furnished with sheepskins, rugs and furniture. We can put up bell tents next to the yurts for additional accommodation for children. There are also a couple of geodesic domes amongst the oak trees. They are fitted with double or single beds, wooden / granite floors, rugs, wardrobes and woodburning stoves. Each dome sleeps two people with space for a small child’s bed or cot. The domes each have a private terrace with outside table and chairs. There is a shared kitchen and dining area (the Eatery) which is well equipped with cooker, fridge freezer etc. There are also shared bathroom facilities - two separate showers in an outdoor shower block and two eco toilets. 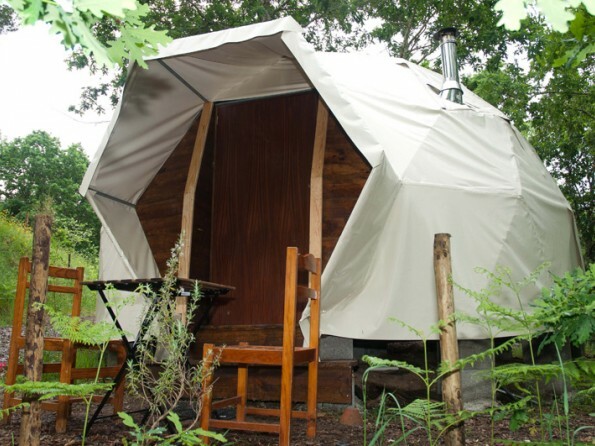 The yurts and domes each have a private terrace in shaded woodland with table and chairs. Come in the summer and you’ll probably want to spend much of your time lounging by the river on one of the farm’s small sandy beaches, or swimming, fishing and kayaking. In spring and autumn you can enjoy exploring the local area and the fabulous walks in the surrounds. If you want to make a group booking then we will happily accommodate that. Quinta da Lontra is an excellent setting for teaching groups (eg yoga, meditation) and events. The on site dome is 80m2 and can set up to 15 people in a circular arrangement for workshops. It is light at airy, and has removable sides and window panels. The material is lightproof so can be closed for complete darkness. Heating can be provided in the colder months. Groups of guests can be catered for in the communal kitchen space, The Eatery, which is nestled amongst the trees and also has a chill out space with hammocks and sofas. There’s a dining area which seats up to 20 people on a long table, a large hot and gas oven, fridge freezer and crockery, cutlery, utensils etc. There’s flat meadowland next to the river which can also be used. There is also a small workshop for woodwork and metalwork, access to a sound recording studio locally, and a PA system and video projector so we really can cater for all sorts of groups and interests! To secure your booking we ask for a 50% non-refundable deposit, 1 month in advance of your arrival date.